This week, the Food and Drug Administration approved a new drug that can help, the first drug approved specifically for postpartum depression. While researchers and clinicians are excited about the drug's potential, some foresee obstacles to making it available to women who need it the most. Postpartum depression is more common among women from lower socio-economic groups, yet the drug, which comes with a $34,000 price tag and requires a stay in a healthcare facility, could be out of reach for many of these women. "Those who have the highest rates of postpartum depression and who would benefit the most, I fear it will be limited access to them," says Dr. Maria Muzik, an associate professor at the department of psychiatry and obstetrics and gynecology at the University of Michigan. And there will likely be logistical hurdles in delivering the drug, adds Muzik, because it has to be given via a one-time continuous IV infusion over 60 hours under medical supervision at a hospital or another medical facility. Depression during pregnancy and soon after childbirth can be debilitating and can even lead to hospitalization for some women. It can prevent a mother from taking care of her baby, which in turn affects the mother-child bonding, the baby's development and emotional well-being. Postpartum depression even increases an infant's risk of having depression later in life. 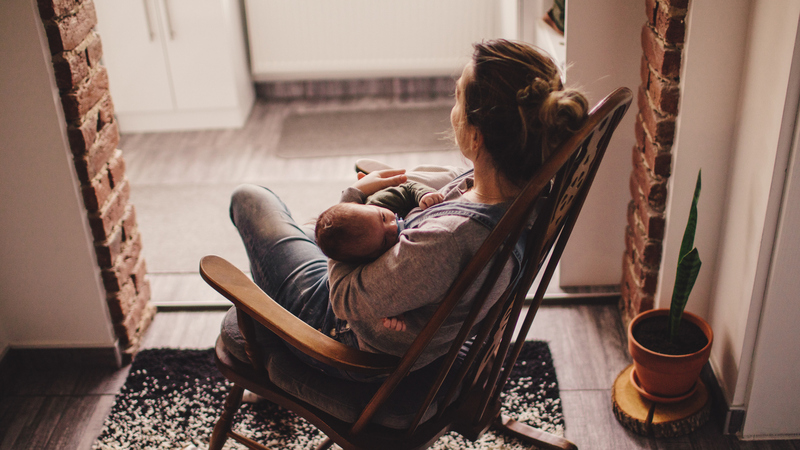 "Postpartum depression is a devastating illness, with implications not just for the women who're depressed, but for their children and their families," says Dr. Joshua Gordon, director of the National Institute of Mental Health. The new drug, brexanolone, which is being marketed by the manufacturer Sage Therapeutics as Zulresso, is unlike other antidepressants. It is a synthetic version of a compound called allopregnanolone, which is naturally synthesized by the body from the hormone progesterone. And it works relatively fast — women who were given the drug in clinical trials started to feel better as early as 48 hours after starting treatment, and the effects lasted for a month. The drug had the most impact on women with moderate to severe symptoms of depression compared to women on placebo, who also showed some improvement. "I think this is a breakthrough," says Gordon. "To be able to offer a treatment that not only works, but works fast is remarkable." Most current treatments for postpartum depression involve talk therapy and other antidepressant medications, like Zoloft and Celexa. But these drugs typically take anywhere between two to four weeks to start having an impact, says Dr. Nancy Byatt, the medical director of the Massachusetts Child Psychiatry Access Program for Moms, or MCPAP for Moms, a program that helps pregnant women and new mothers get better access to mental health care. "For myself, as a provider working with women with severe depression, to have a drug that works within a few days, that is very exciting," says Byatt. She expects that the drug will be most useful for "someone presenting with severe symptoms" and "women who have tried SSRIs and other treatments that haven't been effective for them." Women with chronic depression might also benefit, says Muzik. "That's where it has a major impact with bonding with the baby," she says. "She doesn't respond, she isn't able to care for the baby. The mom loses out on the joy of motherhood. Getting in quickly and helping her — that's a big advantage." But, there are outstanding questions about the long-term effects of the drug and who will have access to it. The research studies that FDA approval is based on only followed study subjects for one month after treatment. "Do we know if this will be a lasting effect?" Muzik says. "We still don't know that." Another concern is breastfeeding, she adds. While women in clinical trials for brexanolone were not allowed to breastfeed during treatment, the studies show that very little of the drug makes its way into breast milk, says Dr. Samantha Meltzer-Brody, who directs the perinatal psychiatry program at the University of North Carolina at Chapel Hill, and led studies on brexanolone. She notes that infants are already exposed to allopregnanolone — the natural version of the drug — in the mother's body. But the biggest concern with the drug will be obstacles in making it available to women who may need it the most, says Muzik. The $34,000 per-patient cost for a one-time treatment is not yet covered by insurance, though the manufacturer Sage Therapeutics says it's working on that. "We've certainly been in encouraging conversations with insurance companies," says Jeff Boyle, a spokesperson for the company. The company expects insurance will cover it, he adds. "They recognize the value of this medication." But about 50 percent of births in the United States are covered by Medicaid. Because women from lower socio-economic groups are more likely to experience postpartum depression, getting Medicaid to cover the drug is "something that should be prioritized," Muzik says. Doctors and perinatal psychiatrists also have questions about how the drug will be made available, whether it's at hospitals or psychiatric facilities, or other centers equipped to give IV infusions and allowing for overnight stays. "The implementation will be a major factor that will either facilitate or be a barrier [to access]," says Muzik. Byatt and her colleagues at MCPAP for Moms are also thinking of the logistics. "Logistically it will be challenging," says Byatt. "There will [have to] be centers that will be infusion centers for women with postpartum depression." Physicians, psychiatrists and nurses will need to be educated about the drug and trained to deliver it, says Byatt. "What we're [also] thinking about is building capacity of frontline providers to provide brexanolone treatment," she says. "Who's going to be providing the treatment? I think it'll be a combination of psychiatrists and obstetrics providers." Meltzer-Brody doesn't think accessibility will be a problem, if insurance companies decide to cover the drug. "I think the world is going to evolve to accommodate this," she says. "It's a new model, but it's 100 percent deliverable." Any obstetrics setting where women deliver babies should be able to provide brexanolone, she says. She says the logistical hurdles can be easily resolved. "I think that it's really hard for people because it's such a new model and paradigm," says Meltzer-Brody. "When we started to think of doing this, people thought we were nuts. They said, 'Why on earth would someone do something like this?' It's always the case when you go into uncharted territory." She says other experts raised concerns about mothers being in a medical setting, away from their babies. But, during the clinical trials, she says, "the babies were around for a big chunk of time." The mothers weren't allowed to breastfeed, but they could hold their babies, interact with them while getting treatment, except at night. "My experience [is] of seeing people coming in enormously depressed, not interacting, not eating, sleeping and interacting with their babies ... and within 60 hours have remission of their symptoms," says Meltzer-Brody. Compared to the severity of symptoms many women experience, staying at a medical facility for treatment "would be a very minor inconvenience for two and a half days," she adds. Muzik says that for lower income women, the inconvenience could be more than minor, as they may not have the resources to allow them to step away from their obligations, and care for their newborn, while they go in for treatment. She expects that providers will need to innovate to make this drug widely available to women who need it the most. There will be a need for "mother-baby inpatient units," says Muzik, so that mothers can bring their babies with them during treatment. And Muzik expects providers will act fast to find solutions. "Over the next six months, I think [there] will be big developments."